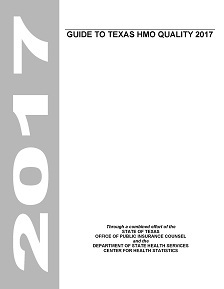 The Guide toTexas HMO Quality is an annual report on the performance HMOs operating in Texas in relation to quality of care. As a consumer you can use this report as one tool to guide your comparison of HMOs. Healthcare Effectiveness Data and Information Set (HEDIS) measures are used to create this report. Texas law requires HMOs to report HEDIS measures each year to the Department of State Health Services. The measures reflect many significant public health issues such as cancer, heart disease, smoking, diabetes, and the care of pregnant women and children. Report is available in PDF format only.